American veterans (AmVets ) State Commander Barbara Horowitz, left, is joined by Col. (Ret.) 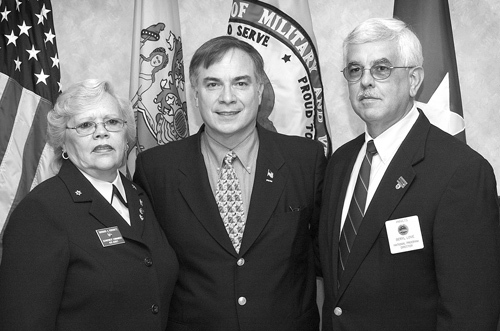 Stephen G. Abel, Deputy Commissioner for Veterans Affairs, center to welcome Beryl Love, AmVets National Program Director, right, to the Veterans Leadership Call. More than three dozen leaders from Veterans Service Organizations attended a Veterans Leadership Call hosted by the Department of Military and Veterans Affairs (DMAVA) on May 20. The goal for the various veterans groups is to be updated on current DMAVA programs and discuss mutual legislative goals so that information could be passed along to the membership at the upcoming state conventions. Brig. Gen. Maria Falca-Dodson, Deputy Adjutant General, briefed the attendees on the current deployments of the New Jersey National Guard and discussed the still ongoing developments of the BRAC decisions, to include status of the VA clinic located on Fort Monmouth. Dodson stated that VA health care should remain on the soon to be closed post and everyone was working towards that goal. One idea DMAVA is looking into is the possibility that the VA clinic could be relocated to the Patterson Army Hospital. The idea is to convert the rest of the hospital into a Veterans Haven, expanding on the success of the transitional housing program in Winslow Township, while adding up to 200 beds for homeless veterans who would like to enter the program according to Col. (Ret.) Stephen G. Abel, Deputy Commissioner for Veterans Affairs. The department has visited the facility and will determine if the former Army hospital will work for such a program before formally requesting that the property be turned over to the state as part of the BRAC process. “We are looking four or five years from now, this is a long range plan,” noted Abel. The veterans share a concern to see the passage of legislation that would realign state regulations to mirror federal guidelines on how to determine eligibility for veteran benefits. DMAVA Director of Government Relations, Dr. Wayne Girardet explained the potential cost to the state and local governments should legislation referred to as ‘Vet Is A Vet’ is approved. There would be a nearly $24 million dollar cost to the state to pay for the $250 property tax deduction if state eligibility matched the federal rules. It is estimated by Girardet that local governments could lose more than $29 million dollars for property tax exemptions for 100 percent disabled veterans. The Veteran’s Retirement Allowance and Civil Service preference would have a minimum financial impact especially the preference provision, which is where the department would like to start the ‘Vet Is A Vet’ process. “Take one bite of the apple at a time,” said Abel, as he spoke about breaking down the ‘Vet Is A Vet’ issue into smaller pieces. At the Veterans Leadership Call in December, then Governor-elect Jon Corzine indicated his support for the ‘Vet Is A Vet’ legislation. Next up to speak was Brig. Gen. Frank Carlini, Director of Veterans Healthcare as he addressed several issues pertaining to the three Veterans Memorial Homes. Currently the homes are all above a 96 percent occupancy rate with Menlo Park and Paramus housing more than 300 veterans each and with Vineland moving towards that number as the new wing is populated. While that is good news for the homes, the bad news is that no New Jersey projects made the VA construction list for this year. The replacement of the heating and air conditioning system at Paramus is a department priority, and every effort will be made to move that project up the VA’s list for funding for this year or next. The public comment period on changes to New Jersey Administrative Code 5A-5, that covers DMAVA facilities, has closed according to Carlini. One of the major changes to the code, was to liberalize the admissions policy. This makes additional former service members eligible to apply for admission to the memorial homes. The percentage of non-veterans who can apply to the homes, which covers spouses and Gold Star parents, will be increase from five to twenty percent. Carlini noted that the current application is being standardized and streamlined for all three memorial homes and will be published on the DMAVA website. The department continued to stress the need for veterans’ organizations to encourage their members to get their VA disability claims reevaluated. “A bad knee doesn’t get better with age,” added Abel. The $35-million dollar expansion at the Brig. Gen. Doyle Veterans Memorial Cemetery continues to move forward as the new administrative and maintenance facility construction is on schedule. The plans to covert the old maintenance building near the entrance to the cemetery into a public information center will be several years away as the more pressing issue of providing additional burial plots or crypts are a priority for the next four to five years. The veteran leaders talked about the annual Stand Downs for homeless vets. The Veterans of Foreign Wars proposed that the Stand Down be longer than a single day, more like the three-day Stand Down event previously held at Fort Dix. The department will ask the groups that coordinate the North and South Jersey Stand Down’s to consider combining the two into a single multi-day event to service the estimated eight thousand homeless veterans in the state. One of the key concerns with the Stand Downs in any format is how to get the information out to the veterans you are trying to help. “These veterans do not have cable TV or have the newspaper delivered to their door every day,” said Gary Englert, Director of Veterans Services. When asked about how to track the wounded or Killed In Action service members in the ongoing Global War on Terrorism, Englert recommend a website, www.thefinalrollcall.us/, as a good source for the latest information. By the end of the half day session the veteran organizations commanders were better informed on the current status of programs in the state and agreed that working together is the best way to leverage the power of membership, because the bottom line is every one is a veteran first.